Talent Acquisition is no stranger to data and metrics and the most progressive of leaders in this space are now leveraging robust and holistic analytics for powerful results – for their organizations and for themselves. 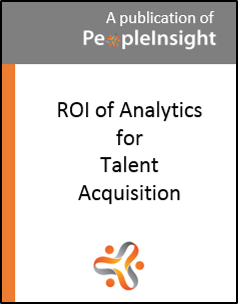 If you’re reading this document, it’s likely that you have a good understanding of the value of analytics for Talent Acquisition and you’re looking to go further – to investigate the ROI of analytics for Talent Acquisition. You may want to deepen your understanding of what Talent Acquisition can achieve based on an investment in analytics and/or you may be anticipating the need to justify an analytics investment in terms of measurable benefits and business outcomes to others in the business. No matter what it is that has brought you here… welcome! We’re here to help.